Here’s your chance to get involved with one of our village’s most popular and worthwhile events! 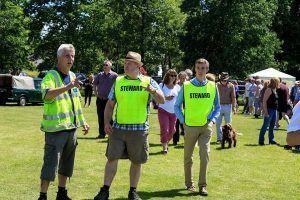 Sherfield’s superb annual fête is organised and run entirely by volunteers, and help is always needed, not just on the day of the fête, but throughout the year. Our organising committee meets regularly to develop the fête’s theme, select and book the attractions, and plan the whole event and all the surrounding activities. We’re always keen to hear from people with new and fresh ideas, and the more people who pitch in, the less time each needs to spend on it. Taking a turn to man a village fundraising stall – meet your neighbours! If you could spare a couple of hours of your time to help our good causes then please get in touch using the form below. Use the space below to let us know what you think you'd be good at.